Summer adventures require maps. will tote bags, t-shirts, and cutting boards do? See image below for more product details. Photograph by Inga Hendrickson. 1. Rustic Heart of NM wall hanging by Darryl Willison ($19). The Albuquerque Museum (505-242-0434, albuquerquemuseum.org). 2. O’Keeffe Sites New Mexico Map tote bag ($22). Georgia O’Keeffe Museum, Santa Fe (505-946-1000, okeeffemuseum.org). 3. 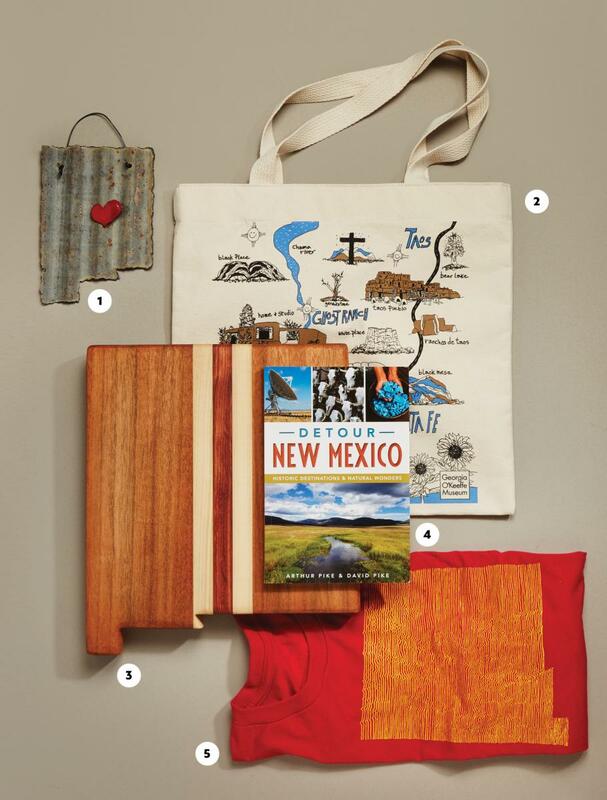 New Mexico cutting board by Bill Hamilton ($65). Fuller Lodge Art Center, Los Alamos (505-662-1635, fullerlodgeartcenter.com). 4. 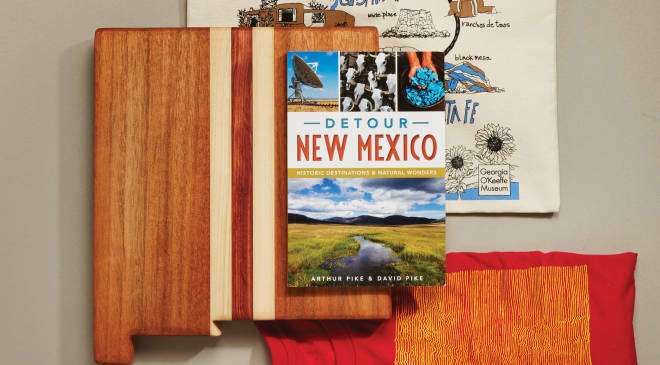 Detour New Mexico: Historic Destinations and Natural Wonders, by Arthur Pike and David Pike ($22). Bookstores everywhere. 5. New Mexico Mountain Range T-shirt ($20). Organ Mountain Outfitters, Las Cruces (575-323-3274, organmountainoutfitters.com).